When you think about iconic Christmas food, what comes to mind? 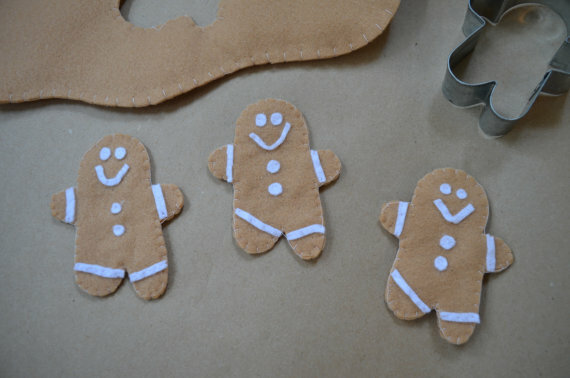 For me, Christmas is all about gingerbread cookies. My loyal readers already know the amount of time I spend and the joy I have making Christmas cookies each year. (For you newcomers, click here and here for reference.) So when it come time to add a few Christmas items to my Etsy shop, I could stop myself. I didn’t just want to make felt gingerbread cookies. 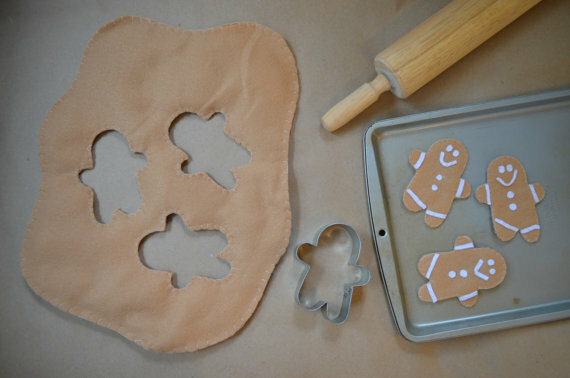 Because even though the felt cookies turned out so darn cute, the fun is in the baking. I didn’t try to make the cookies from the cut outs in the dough. This would have too much room for error. 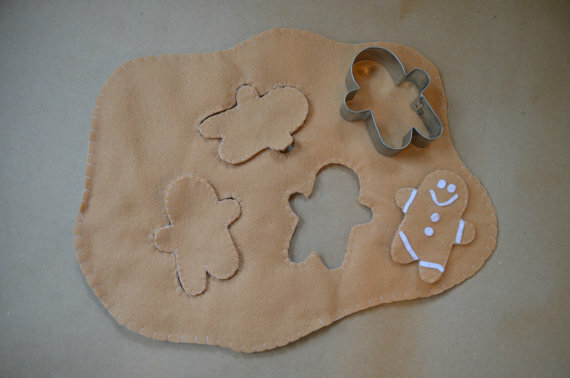 So I cut the cookies out (using a 99 cent cookie cutter from Target) from spare felt and use white felt to adorn them. 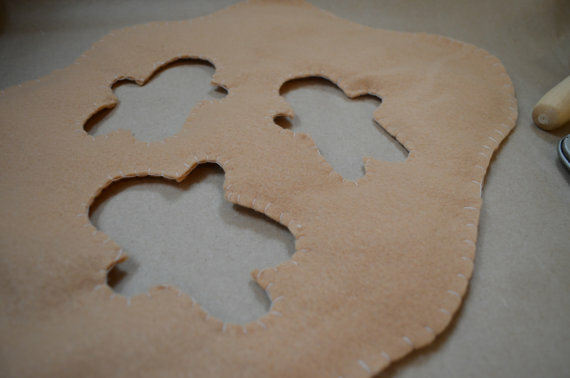 For the dough, I traced and cut out the cookie cutter shapes. I placed a layer of batting (leftover from a quilt project) between the two pieces of felt, and blanket-stitched the edges. The batting add some dimension to the dough, which I hope makes it more realistic when a child “rolls” it out. I tried to leave as much room for a child’s imagination to go wild. Cookies fit the dough like a puzzle. 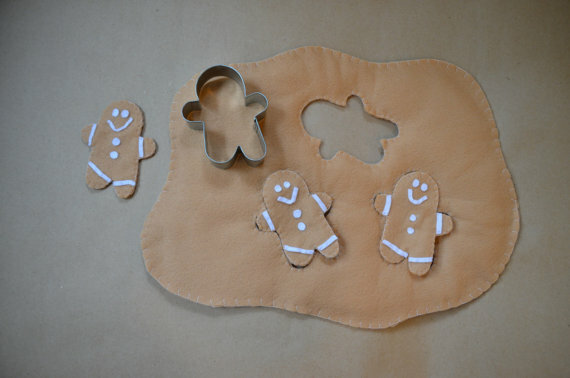 And since the set includes the actual cookie cutter, they can pretend to “roll,” “cut out” and “bake” cookies all day long. 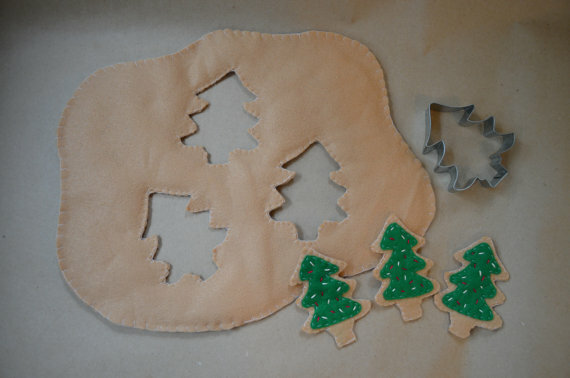 I also made a set with Christmas tree cookies. Same idea, different shape (and same unbeatable price)!